This entry was posted in Uncategorized on March 30, 2017 by Gary. If you apply the Bollinger band crash strategy to an index like the SPY or QQQ you probably will make a little money over the long haul. Heavy emphasis on the words “a little”. On the other hand if you apply the strategy to individual stocks you will lose money over time. The system still has the same 92-96% win rate, but the few big losers overwhelm the many small winners. So that over time you consistently lose money. But if I wanted to sell you a newsletter I could point to my success rate and claim that I have an almost fool proof system for making money, and many people would believe me and buy my service. They would even be happy as trade after trade would produce wins. But then a year or two later they would realize they aren’t actually making any money. Day trading is pretty much the same. Many people have a system that makes money on a lot of trades, but over the long haul those many small wins aren’t enough to offset the few big losses. On the other hand I’ve seen traders that only win 20-30% of the time, yet make huge long term gains. How? The are cutting their losers quick, and when they do catch a winning trade they let it run into a large profit. So they only need a few big winners to more than offset the many small losses. How many people would buy your newsletter if you told them you only win 20% of the time? Not many I suspect. I see people freakout (or gloat) every time we have a losing trade. But the strategy I prefer, is to try to pick bottoms. Understandably we can get stopped out a few times as we try to catch the bottom. But if we can enter close to our stop the losses are minimal. Once we do catch the bottom we are in at the beginning of an intermediate rally and we then have the opportunity to ride a sizable run for many weeks. We don’t produce an exceptionally high win rate with this system but we do consistently make money over time. And in the end it’s the bottom line that matters. Are you increasing or decreasing your portfolio over time? We missed several times trying to catch the bottom in gold in December. Once we finally did we ended up making good money on the run. So our winning percentage wasn’t high, but our profits were. This is why I prefer to use cycles and sentiment as my two main tools. They offer the best strategy to get us into a trade that has the potential to produce a big win. But they don’t usually deliver an extremely high win rate. It can take several attempts before we get it right. But once we do we have to chance to produce a big gain. After watching several markets unfold over the last few weeks I think I have a pretty good idea what is in progress. As I said in my last video, gold is probably stuck in a difficult triangle this year. Stocks, oil and the currencies are a different story. 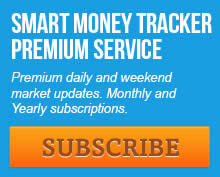 For a limited time I’ll discount $100 off the yearly rate of an SMT premium subscription. The discount will be applied as a rebate. offer is only good for new subscribers. It does not apply to current subscriptions. There is little doubt that gold is now in a bull market. However, gold is stuck within a complex sideways triangular consolidation pattern which may continue for the rest of 2017. This entry was posted in Uncategorized on March 29, 2017 by Gary. The stock market daily cycle low is in. We now begin the 3rd daily cycle within the larger intermediate cycle. Expect stock markets to now go on to make new highs. This entry was posted in Uncategorized on March 28, 2017 by Gary. This entry was posted in Uncategorized on March 27, 2017 by Gary. The intermediate cycle low in stocks is expected sometime this week. The rising price trend line is likely to be broken to the downside before the bottom is reached. The dollar will probably bottom at the same time as the stock market, with the precious metals putting in a top. This entry was posted in Uncategorized on March 25, 2017 by Gary. As I noted in my last COTD, there are signs popping up that stocks are about to, or have completed a very mild intermediate cycle low. The vast majority of traders decide to buy (or join the SMT) after most of the move has already happened. Last summer my biggest influx of new subs occurred right at the summer high in metals. No one wanted to join the SMT in January when I was calling the bottom. They waited till the move had rallied 180% before joining. Go figure. Now I’m telling you again that we are about to start the final bubble phase of this bull market. Most traders are still looking for the next bear market, and have been since 2010. So are you going to make the same mistake again and join the SMT after most of the bubble phase has already passed you by or will you do something different this time and get in before the move happens? 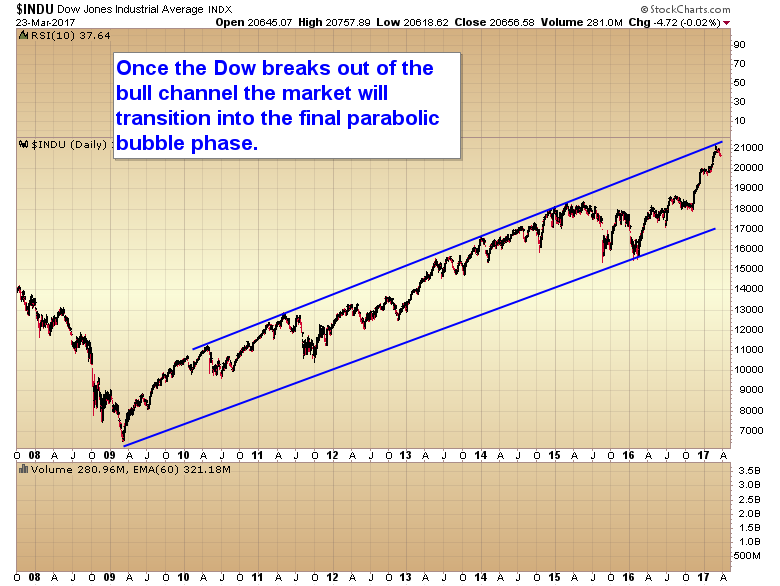 At this point I’m just waiting for the Dow to break out of its bull channel to signal it’s game on. This entry was posted in Uncategorized on March 24, 2017 by Gary. CHART OF THE DAY – Intermediate Cycle Low? 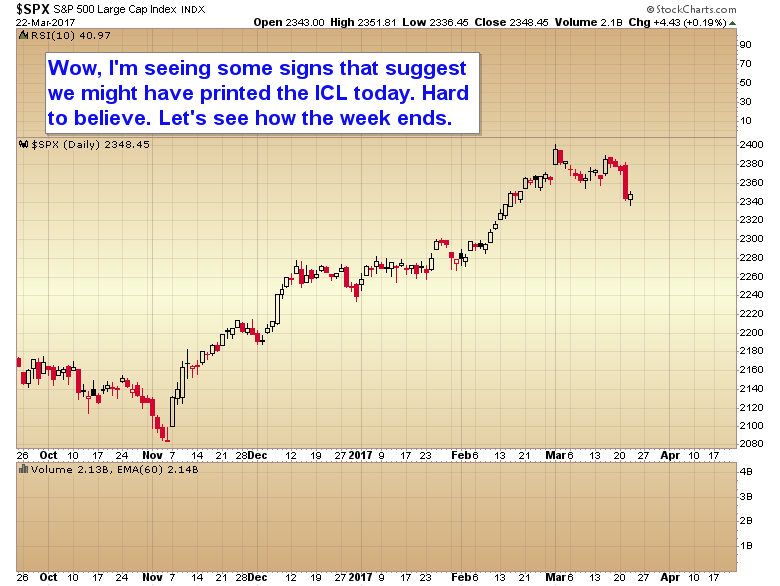 Stocks – Intermediate Cycle Low? This entry was posted in Uncategorized on March 22, 2017 by Gary.